Woven of nearly transparent Bengal muslin, this angarkha, or long, open-fronted men’s tunic, belongs to the Weavers Studio Resource Centre in Kolkata, India. We encourage reproduction and adaptation of these ideas, freely and without further permission from AramcoWorld, by teachers and students at any level. Summarize the history of muslin. Analyze the story, "Our Story of Dhaka Muslin," from geographic, economic and political perspectives. Apply what you've learned by using those perspectives to analyze something else. 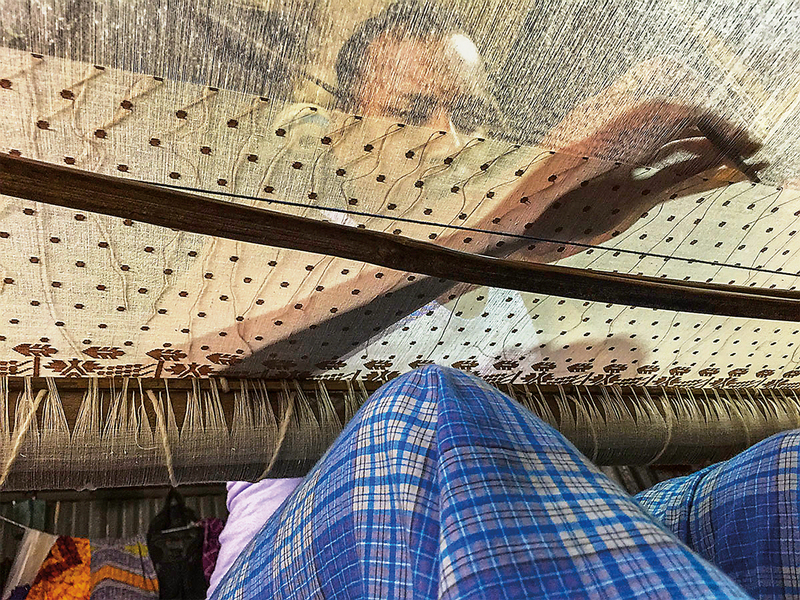 Read "Our Story of Dhaka Muslin," by Khademul Islam. As you read, use whatver methods work for you to focus your attention on and help you remember the important parts of the article. You can underline or highlight, or make notes in the margins or on paper or computer. Circle any words you come across that you may not know. Try to figure out what these words mean based on the context from the other words and sentences around them. If you can't figure out the meaning that way, look up the words. When you're done, write a few sentences that summarize the article. Then write a few more sentences stating what you found most interesting in it, and why you found it so. Pair up with another student. Share what you've written with each other. Are your summaries similar? Have you both identified the key points the article makes. If not, discuss the differences and see if either or both of you need to revise or add to you've already jotted down. Then, determine if each other's points provide interesting insight. If not, discuss further ways to improve on your thoughts. Once you understand the basic story of muslin, you can begin to thing about it more deeply. First, prepare a word web on chart paper. In the center, create a circle with the words, "The History of Dhaka Muslin," in it. For each section of the story, make a circle that radiates out from the center circle and follow the instructions to fill it in. You can do the following activities on your own, with a partner or as part of a small group. 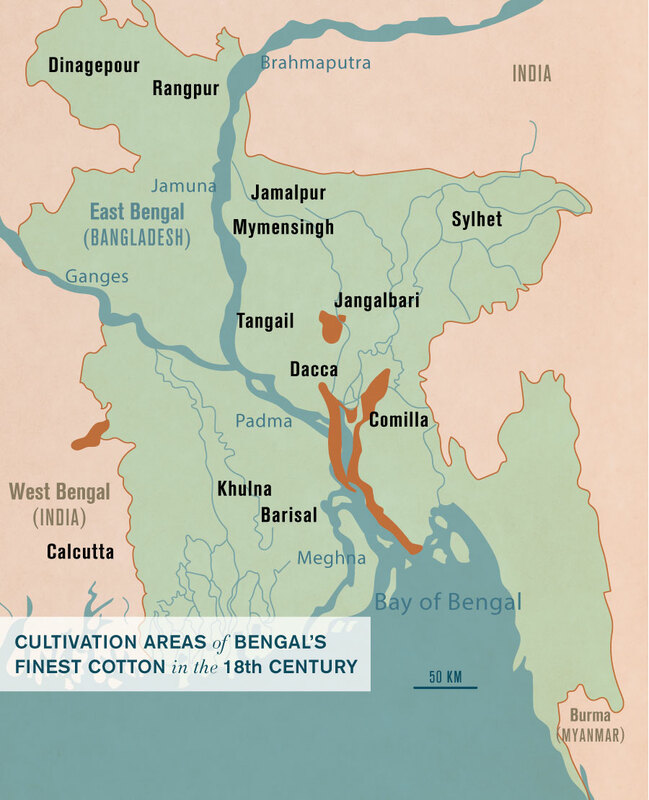 A number of factors affected the development of Dhaka muslin, and its rise and fall as an item of value. Start with the place where Dhaka muslin was produced. Write "Geography" in one of the circles on your graphic organizer. One curious point that the author makes is that the cotton plants used to make Dkaha muslin do not grow anyplace else. That means there must have been something quite unique about the area where the plants did grow. What was it about the place that made it ideal for growing the cotton plants, phuti karpa? Hint: Think about what it was near (in geographers' terms, its location and what the climate was like). In the geography circle of your word web, write what it was about Dkhaka's location and climate that led to muslin being made there. What else about the geography enabled such spectacular muslin to be produce there? Hint: Think about the people—their skills and way of life. Add these also in the "Geography" circle. Label another circle "Politics." You'll fill it in by answering the questions that follow. Dhaka muslin became entangled in the politics that surrounded its production and distribution. Think about politics as being both political and, more broadly, about power. Find the parts of the article that address politics. Here are a few questions to get you started. How did Mughal leaders use muslin, and what did muslin signify to them? How did the British Empire affect the rise and fall of Dhaka muslin? Use your answers to these questions to fill in the “Politics” circle of your web. Label another circle on your web “Economics.” Dhaka muslin became a valuable commodity on the Indian subcontinent, in China, on the Arabian peninsula and, eventually, in Western Europe. Find the parts of the article that refer to the buying and selling of muslin, including the discussion of trade and industrialization. You’ll probably notice that the economic factors sometimes overlap with the geographic and political factors. That’s OK—the world doesn’t organize itself neatly into academic disciplines, and so your web may well reflect that. Now you’ve analyzed the history of Dhaka muslin from geographic, political, and economic perspectives. Study your graphic organizer. Use it as an outline to write an essay that has this thesis: The history of Dhaka muslin was shaped by geographic, political, and economic factors. A true test of how well you understand something is whether you can use what you’ve learned in a different context. Try it out. Make another web with the same three circles—geography, politics, and economics—coming out from the center. Choose a topic to analyze. It can be something you’ve studied in a history class or something that’s been in the news. For example, you could write “French Revolution” in the central circle and analyze it. Or you could write “Netflix” in the center and analyze the geographic, political, and economic factors that have contributed to its success. These are just a couple of ideas. Choose whatever topic you’d like and complete the web.